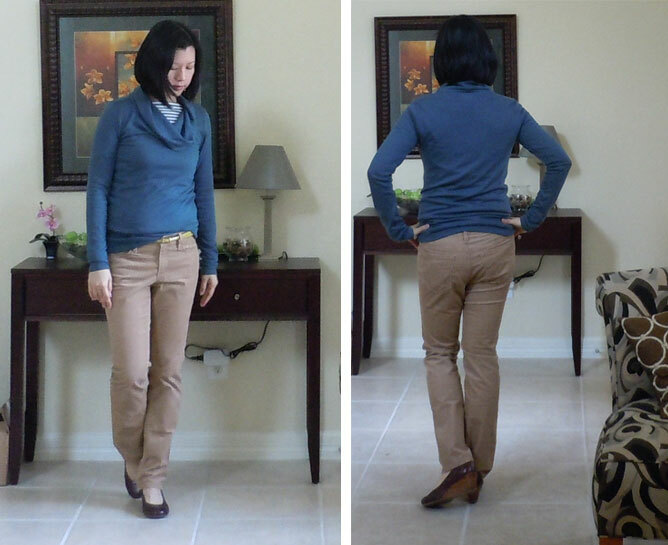 I bought the Cowl Neck Tee in 3 different colors – Desert Sand, Ultra Plum and shown Mystic Ocean. I love these cowl necks. They are soft and comfy. I like these more than a turtleneck because it’s looser and doesn’t constrict. So if it gets too hot outside, I’m less likely to overheat. For a nippier days, I’ll add the boatneck tee underneath for extra warmth. Now it hasn’t been getting that cold. It’ll be windy, and chilly in the morning but by noon it’s in the High 70s. Perfect for shorts and a tee. By putting on thin layers and just pulling them off when the weather changes, I’m able to adjust my outfit right at work or wherever I’m at. I don’t feel like I’m wearing that much layers. It’s very light. The same goes for the Modern Slim Leg Cords. The ones I’m wearing is Incense Khaki. I also have it in Pink Rouge and Grey. These are lightweight cords that hug to my body and don’t feel like denim at all. The only complaint is that when I walk, the fabric on the inside of my thighs rubs together and it makes this grrrr, grrrr noise. A bit annoying. These glasses are not the average dainty sunglasses. I love the tilt of the glasses – the cat eye expression- very seductive. Why I had to have this pair? It’s PURPLE! Yes, the other side is striped purple to give a funky edge to the sunglasses. This is my go to pair now. It fits nicely and doesn’t pinch the sides of my head (like my Michael Kors one) and there is no pressure on my ears. This entire outfit is easy to wear. I can wear it grocery shopping, hanging out with my kids, even go to my work (my office doesn’t have a dress code but still need to keep it professional). The pieces of clothing are easily mixed and remixed. Have you run into any versatile pieces lately?